Straight, healthy teeth are largely considered the foundation for a beautiful smile, but not everyone is fortunate enough to be born with properly aligned teeth. For many adults and image-conscious adolescents, the idea of wearing traditional metal braces to correct a crooked smile simply isn’t appealing. At Westside Dental Associates in Los Angeles, CA, Dr. Les Latner offers a cosmetically preferable alternative to conventional orthodontic treatment in the form of Invisalign clear braces. Will Invisalign Work for Me? The Invisalign clear braces system has quickly become the preferred method to effectively straighten teeth for countless teens and adults in America, and it isn’t difficult to see why. Rather than utilizing bulky metal brackets and wires to gradually ease teeth into their proper positions, Invisalign incorporates customized clear plastic aligners that fit your unique dentition precisely. The aligners are comfortable, virtually invisible, and can be quickly and easily removed for eating, cleaning, and brushing the teeth. 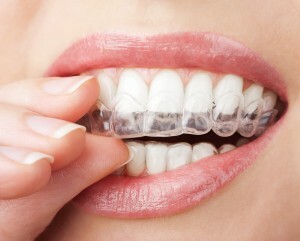 Another advantage of Invisalign clear aligners is the speed at which the system works. Whereas regular orthodontic braces can take years to provide desired results, Invisalign offers a straighter, healthier smile in the span of about 8 to 12 months on average. You can feel free to smile comfortably and confidently as the clear aligners safely and effectively straighten your teeth. A consultation with Dr. Latner will help you gain a comprehensive understanding of this treatment and its innumerable benefits. If you have always wanted a straighter, more beautiful smile but have hesitated to seek orthodontic treatment because metal braces simply don’t fit your lifestyle, Dr. Latner can help. Contact our office in Los Angeles, CA today to schedule your one-on-one consultation and discover the difference our cosmetic dentistry solutions can make for you. Our family-friendly dental office happily welcomes patients from throughout the Los Angeles area and surrounding communities, including Beverly Hills, Santa Monica, Brentwood, Venice, Rancho Park, Culver City, Mar Vista, West LA, Playa Vista, Marina del Rey, and beyond. by: Les Latner at April 30, 2014 .